Welcome to Sofitel Agadir Thalassa Sea & Spa. With its own private beach and seawater spa, your stay will bring you vitality, tranquility and serenity. Discover the magic of the ocean where wellness and rejuvenation are at the heart of everything we do. The hotel is located on the beach of Agadir and the Agadir Kasbah is only 6km away. The hilltop Kasbah is a rare survivor of the 1960 earthquake. From the top you will be able to seeing amazing views of the port, marina and the city . Discover Agadir and its bazaars. Visit the majestic Kasbah, which has overlooked the town since the 16th century. Breathe in the invigorating sea air and watch the feluccas drifting on the horizon. Dark, muted tones combined with elegant materials give you a feeling of privacy and serenity in the heart of Amazigh capital. All rooms and suites have a furnished terrace or a balcony with a choice of views over the swimming pool, dunes or sea, each with soft, natural light. Watch it; there are two Sofitels in Agadir, right next to each other. The Thalassa Sea & Spa is a very nice Sofitel-level hotel. Clean, confortable and quiet; perfect for "getting away from it all". Excellent for those who don't really need to go into town; everything you need is right there, including direct acces to the beach. Carefull, there are two Sofitels in Agadir situated side-by-side, on the ocean front. On extended stays, you may wish to pop over to the other Sofitel for added variety in reastaurants or entertainment. Staff are efficient and friendly yet discreet (they don't overdo it). Special mention for Mounir, who was always making sure all was well. Fantastic hotel and Staff - the reason we keep returning! Overall had a fantastic stay. Hotel is very nice, but it's the amazing staff that keep bringing us back - this is now our third stay at Sofitel Thalassa and Spa! I would like to especially mention Ghizlaine, the Guest Relations Manager, who went out of her way to ensure that we had an excellent stay. My family and I are very thankful to her for that. I hope we see her at this hotel for many years to come. Also, I would like to thank Noura at Reception for her excellent customer service skills. Receptionist Karim made our stay great when welcoming us and chosing our room. Birthday congratulations (70 y), cake and song made my day unforgettable. We had a great experience. The service was great and the week of treatments at the thalassotherapy was excellent. Thank you very much again to the all staff of Sofitel Thalassa Sea and Spa! Food amazing ! Staff so friendly. Fantastic hotel and features. Will be back for sure. THANK YOU !! I am General Manager of a 5 star hotel. 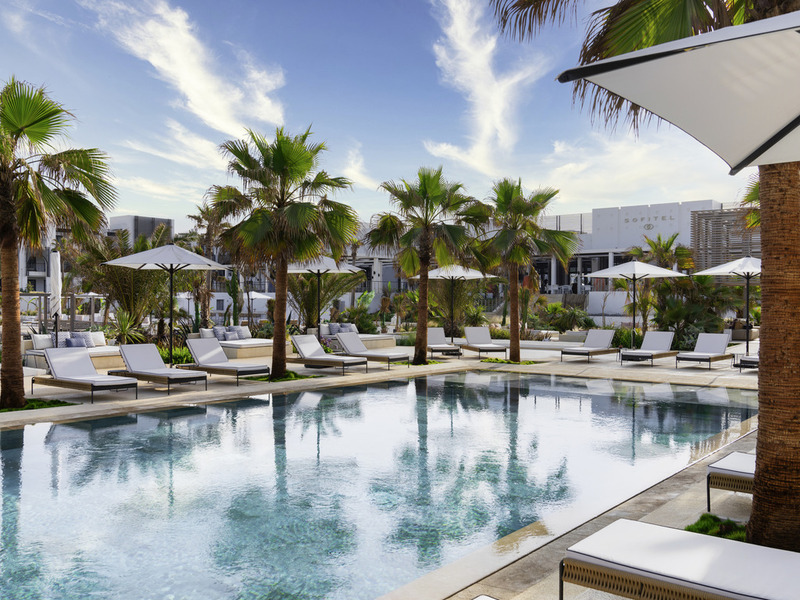 I can tell you that I am very much looking into details and also overall experience.... My stay at the Sofitel Agadir Spa was really amazing. The food experience was memorable. A big BRAVO to the Chef and its team. Breakfast was excellent. Choice and quality at a high level. Fruit juices freshly made and the pancake station with all Moroccan offers are just fantastic ! We also tried 4 restaurants between the 2 Sofitel, all were really of high quality. We tried many different specialties at the Moroccan restaurant, so delicious ! The entire team was great. Smiling attitude anytime. Housekeeping and pool staff were all stars ! Rooms were clean and very comfortable. I will for sure be back and tell great feedback to my friends and family. Check in procedure was frustrating as we were upgraded to a room without a sea view. This meant there was a long delay to get the room we had originally booked. This delay meant we were not in our room over an hour after arrival. Other issues were the room not cleaned on our second day despite informing reception and the shower hose leaking and needed replacing. The most frustrating issue is that my credit card was charged twice on my original booking. I had discussed this with reception and after investigating I was assured the refund of 6358MAD would be refunded to my card. I was given a letter confirming this. On returning to the UK I am still waiting for this refund. This delay is unacceptable and the hotel has not responded to my emails. In addition it appears 3000MAD has been charged to my card which I assumed was a deposit on arrival. I did not spend 3000MAD at the resort so am shocked this has been charged. I do not understand why the financial transactions at this hotel have been so poor and why a loyal customer is not communicated with. Worst 5* experience that could possible be experienced. After arriving at the hotel and taking money from the car before the bell boy (man) parked the rental car. The bell man decided the money in my hand was his tip... it was not. I let this go as an error on his part and it was only 20dirams.... but it was not his tip he just took it out my hand. After that the gentleman on reception decided to “ double upgrade” us for no reason. We waited over an hour for them to prepare the “prestigious suite”. Once it was ready we were led there. Nothing was explained regarding restaurants in the hotel, where the spa was, room service menu was not in the room, the shower essentials were not stocked, the towels were wet and damp!, the room had nothing in English... we are from England we do not speak French. There was paint peeled off the wall all over the floor on the balcony area too. That evening we got dressed up to eat at the hotel. We went downstairs and I asked which restaurant in the hotel would be nice to eat. After veing led to their “palace of Jordan reataurant” we were ignored all evening by the worst maitre de in the history of service. We received the most plain, bland, tasteless, badly prepared food I’ve ever eaten in my life. The maitre de refused to call a manager of the hotel, didn’t pour our drinks, hid her name from me when I asked for it and left us eating in crumbs from the bread we were first served. My thumbs hurt from how much I have written, but I need to try and deceive the awful service from no one speaking English properly, terrible housekeeping and an overall terrible and worst hotel experience I have ever, ever had. The most wonderful hotel experience I've ever had the pleasure of experiencing. It was amazing. The hotel staff went above and beyond to make my partner's birthday really special. A lot of little surprises that we absolutely loved and it really made our last few days in Morocco so wonderful. We would come back to Agadir simply to stay at this hotel. Everyone that works in the hospitality industry should stay at this hotel because this is hows it done! from check in to check out, this hotel is nothing less then outstanding. from the doormen to the front of desk to the maid service everyone is professional and friendly and made me feel right at home. I would especially like to extend my gratitude and appreciation to Asma, (guest relations) for her exquisite attention to detail, her enthusiasm in answering all our questions, her knowledge on the city and her extraordinary personal graciousness. will be most deff be staying here again upon my return to agadir. my experience at the hotel was the most definitely 5 star. From the moment I arrived I was greeted by extremely friendly,happy and helpful staff. The staff at the Sofitel went above and beyond from Management to house keeping. There wasn’t a need requested that wasn’t met I requested for example a shaving razor at 1am and I was promptly sent one to my room. I would like to take this opportunity to personally thank Asma and Hashim for their hospitality it was a major factor in making my experience as positive as it was between them both they single handedly looked after my wellbeing after a foot injury from organizing a wheelchair to take me to my room to the smallest of needs such as icebags and taxis to and from my hotel. On my next return trip to Agadir I will be only booking at the Sofitel for the high level of hospitality. Excellent - food, location, rooms and service are all outstanding. Dear Mr P., Thank you for the great review of our hotel! We are glad that you enjoyed your stay and hope to see you again very soon. Sincerely, Ghizlaine El Kabous. Guest Relation Manager. From the check-in to the check out, outstanding prestation from every member of the staff. Niceness, great service and always a big smile, we felt at home (even better !) and more than welcomed. Food is great, from breakfast to restaurant, room-service and self-service. For the concerts, great prestations as well, always entertaining. Perfect trip for us. And of course, high-class decorum, from room to pool. Dear thibaud D., We very much appreciate your comments regarding your stay at the Sofitel Agadir Thalassa sea & spa. It is always a pleasure to receive positive feedback. I will share your comments with our team. I am sure that this feedback will serve as an encouragement to all of our staff as we strive to continuously improve the quality of our services. Thank you again for sharing your experience, and we hope your next visit will be as pleasant as the previougs one. we will definitly keep on smiling to make all our Guests feel at home or even better as you said. Sincerely, Ghizlaine El Kabous. Guest Relation Manager. Had a wonderful stay at the Soiftel Agadir Thalassa, enjoyed the breakfast and pool area and the staff were exceptional, to name just a few, our maid Hassna and Lamtabti were very efficient, and Ghizlane El Kabous was charming. splendid hotel with exceptional service, in a great location, which was warm and inviting. the location of the hotel was a wonderful sun-trap with a splend pool and beach facilities. The restuarants were well designed with a verity of splended foods, we enjoyed every meal. we found that the headwaiter, waiters and chefs were extremely good as discribing the menues as everything was in french and we were english and spoke very little french. we found the service staff were very friendly and helpful the hotel was kept very clean our room was change reguarly. we can only say what a splendid time we had with you and your team which made us feel very relaxed and had a wonderful holiday. The hotel was beautiful and the food was terrific. But, the surrounding was often quite infuriating. We were often harassed just walking next door to the sister hotel. People knew that because we were staying with your hotel the became extra aggressive with us about money. It was a lovely weekend in Agadir, the city, the weather and the hotel were all perfect. It is a pity that there was no many tourists in Agadir, everyone goes to Marrakech.I asked when booking, when checking in and the same day for a late check out but I was told I have to empty the room at 12:00 because guests were expected to check in. Too bad since the hotel was clearly empty!